Best known and made popular from the series of LAD books by Albert Payson Terhune, and from the radio and television series of “Lassie,” the Collie’s primary focus is their loyalty and love for master and family. This beautiful breed started out as lowly working dogs, cherished only by the farmers who relied on them to watch their flocks of sheep. The original Collies were predominately black, and closer in size and shape to the Border Collie, versus the large, heavy-coated breed we know today. In the 18th century, the dogs that worked the rough terrain of Scotland’s hill country and endured its cold, blustery winters had to be hardy and independent and able to work far away from their masters. They had to be both quick to respond to commands and able to solve problems on their own, for the lives of the sheep often depended on the response and decisions of the dogs. 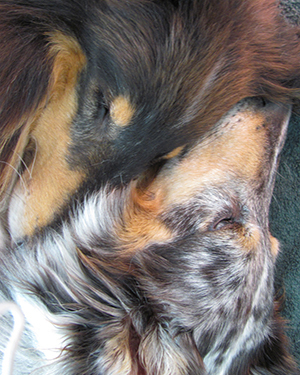 This intelligence, independence and responsiveness are the characteristics of our modern-day Collies. While the breed may have originated in Scotland, it is England that popularized and changed the breed. There, Collies were first exhibited in 1860 in a “Scotch Sheep Dogs” class; Queen Victoria attended this show. Adoring the breed, she began keeping Collies with her elegant and graceful Borzoi at Balmoral Castle in Scotland, soon after, other wealthy people including J.P. Morgan began keeping Collies. Some felt the Collie would be more graceful and appealing if they had the nose of the Borzoi; thus the Borzoi and Collie were bred. All show dogs had to have the Borzoi blood for them to win in the show ring. The working dogs (Scotch Collie) separated and returned to the farm, while the show type is what we see today—larger dogs with flatter faces. The English Collie (with its Borzoi influence) was imported here in 1879. This breed’s sensitive nature descends from its herding heritage, making the Collie a wonderful housemate, ever watchful and protective of the home front. Collies are their own breed, not to be confused with Shetland Sheepdogs, (aka “Shelties”) who look very similar in coat and coloring, but are much smaller. Collies are members of the AKC Herding Group, possessing the typical herding traits, which can be endearing or annoying. They can herd anything from sheep, goats, and ducks, to children! Collies can “talk.” It’s not a bark, but rather a sound they make in the back of their throat while moving their jaws, just as if talking to you. You can encourage the communication by ‘talking’ back to them. Generally, the talking is when they are playing, or when they want something—either from you or another dog. It is quite endearing! Families whose children are more than 4-5 years old. Active singles and seniors, loving to be with you wherever you go. People who are willing to invest time in regular brushing and occasional professional grooming. Inactive or absent owners, those who work long hours, and/or are gone from home a lot. You cannot abandon a Collie to an empty home, back yard, or garage, or his spirit will break. People who can’t stand the idea of fur. If you cannot tolerate some hair in the house, regardless of diligent grooming, a Collie is not for you. People with allergies to dog dander. Those who believe a loud firm voice and hand is the way to discipline inappropriate behavior; this will damage the Collie’s sensitive nature. People who can’t tolerate a vocal dog: Collies can be quite vocal, some more than others, although they tend to bark for a reason, rather than just to hear themselves bark; training will quiet them. People who work long hours, and/or are gone from home a lot. Those who expect their dog should be left outdoors most of the time. Again, a Collie’s spirit is meant to be with and around his or her family. Their need for people companionship; their loyalty; their intelligence; their devotion. Their need for people companionship; their grooming requirements; their size. Females: Preferred height at the shoulders is 22-24 inches, and roughly 50-65 pounds. Males: Preferred height at the shoulders is 24-26 inches, and roughly 60-75 pounds. There are currently four AKC recognized colors; sable and white, tri-color (black, white and tan), blue merle and white. Sables come in a variety of shades; pale golden to a rich gold to a reddish gold to the mahogany sable with rich dark shades covering the back and sides. The sable-merle is currently under consideration as a recognized separate color. You seldom see the beautiful unusual white collie with a sable, tri or blue merle head. An exceptional family dog; part of the magical mystique of the Collie is the special relationship they develop with children. However, some Collies with strong herding instincts may tend to ‘herd’ young children, especially under the age of 5. As with all dogs, adults must teach both dog and child how to respect one another. Since the Collie’s heritage is from shepherding many animals, their ability to get along with other animals and dogs is second nature. Being the social breed they are, you will find them to be exceptionally eager to meet and make new friends with other dogs. Some Collies not raised with cats may exhibit strong herding tendencies, but with training, your kitty and Collie can get along well. Highly intelligent and trainable, Collies are able to quickly grasp the situation and respond accordingly. Some puppies nearly housetrain themselves! 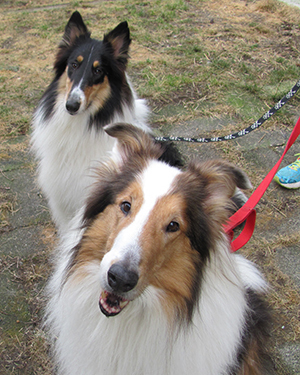 Collies are successfully trained in Obedience, Rally, Agility, Herding, Carting, Assistance and Therapy. Collies thrive on being around people; an obediently trained therapy Collie can light up faces and bring much joy to the young and old. 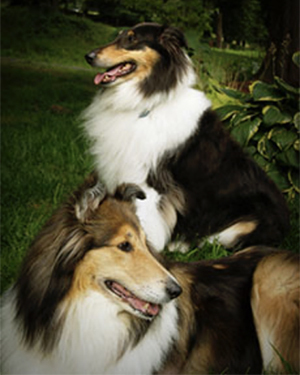 Two types of collies are the Rough coat—the “Lassie” type with a long full double coat—and the Smooth double coat. Here in the United States, the Rough Collie is much more popular than the Smooth Collie; the Smooth Collie is more popular in Great Britain where many prefer its short, hard, dense, flat coat of good texture. The Smooth Collie is the same as the Rough Collie, simply without the long coat. Weekly brushing is highly advised for both types to keep the coat looking its best, to maintain healthy skin, and to keep free of mats. Roughs ‘blow’ their coat sometimes twice a year, causing heavy tufts of shedding; professional grooming may be helpful during this time. Frequent bathing can damage the coat and dry the skin; usually about 4-5 times a year is normal for bathing. Professional grooming is not required but is very helpful for proper mat removal, trimming hair around feet, pads, ears and keeping nails trimmed. Collies should never be shaved, only under extreme circumstances such as medical reasons. The double coat keeps them both warm and cool. Having a professional groomer remove some of the undercoat in the summer, especially on the tummy, will help keep your Collie more cool. Although they are known to be a healthy breed, Collies are prone to being born with eye anomalies. Reputable breeders have their puppies’ eyes certified between 7-8 weeks of age. As is common in many large breeds, hip dysplasia, heart problems, and epilepsy can occur, although they are not common problems in Collies. Cancer can also occur, but it is no more common than any other breed. Other common problems include skin allergies, multi-drug sensitivity, and arthritis—the same problems faced by many breeds.